This 5-in-1 ground-breaking formulation exfoliates, renews, softens, moisturises and protects! Oat Oil, Sweet Almond Oil, Shea Butter, Alpha Hydroxy Therapy plus our unique LAH6 Skin Hydration Complex combine to care for the skin on both the palm and back of your hands while being proven to moisturise for up to 12 hours. 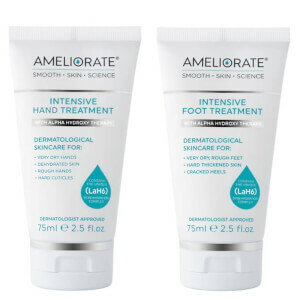 Clinically proven and dermatologist tested, AMELIORATE Hand Treatment deeply hydrates very rough, dry skin, softens cuticles and leaves normal skin amazingly soft and conditioned. Hands are left feeling soft, moisturised, conditioned and healthier-looking. 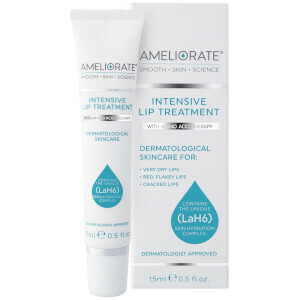 Clinically proven to moisturise for up to 12 hours. Tested on 101 people with very dry, dehydrated, rough hands & dry cuticles. DIRECTIONS: For first use massage into hands, nails and cuticles and leave overnight. Thereafter apply at least twice daily and leave overnight if possible. , C12-15 Alkyl Benzoate, Cetearyl Alcohol, Trimethylpentanediol/Adipic Acid Copolymer, Glycerin, Prunus Amygdalus Dulcis (Sweet Almond) Oil, Ethylhexyl Palmitate, Glyceryl Stearate, PEG-100 Stearate, Avena Sativa (Oat) Kernel Oil, Butyrospermum Parkii (Shea) Butter, Hordeum Vulgare (Barley) Seed Extract/Extrait D'orge, Dimethicone, Phenoxyethanol, Fragrance (Parfum), Sodium Benzoate, Xanthan Gum, Tocopheryl Acetate, Potassium Sorbate, Pentylene Glycol, Hydrolyzed Milk Protein, Disodium EDTA, Lactic Acid, Serine, Sodium Lactate, Sorbitol, Urea, Linalool, Citronellol, Citrus Aurantium Dulcis (Orange) Oil, Limonene, Coumarin, Juniperus Mexicana (Cedarwood) Oil, Alpha-Isomethyl Ionone, Sodium Chloride, Pelargonium Graveolens (Geranium) Oil, Geraniol, Allantoin, Tocopherol. Finally! The most effective hand cream! 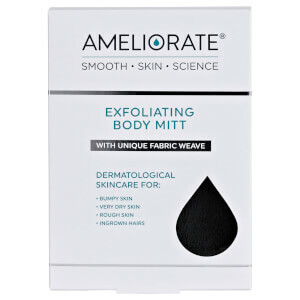 Thank you Ameliorate! Since I was a child my hands have been dry, rough, prematurely aged looking and uncomfortable due to eczema. Often shaking hands I'd want to apologise for how dry my hands must feel. I have tried every cream and oil I could find but they made little difference and I would need to use a lot of the product every couple of hours. Ameliorate Hand Cream has dramatically improved my hands. They look smoother and more even in colour but it's the feeling that I am most impressed by. My hands, for the first time in my life, feel velvety-even my palms and knuckles which have never responded to any other cream! I'm so grateful to have found this product! Rarely have I been compelled to leave a review for a hand cream, but this one is just superb. Having used this on a daily basis for a couple of weeks, the difference in my skin was quite significant. I also noticed that my nails were less brittle too. All round this has to be one of the best hand creams I've ever used. Really love how much this hand cream nourishes your hands making them look smoother, softer and younger. I very rarely use handcreme as often it tends to be very greasy. I was pleasantly surprised that this was absorbed easily into skin making it feel wonderfully soft. The fragrance was also very attractive, subtle but not overpowering or sickly as some cremes can be. This is the best hand cream I've used and I have tried lots of different products. My hands are very dry, but it leaves them looking smooth and much younger. I apply it every night and once during the day and have seen a huge improvement in my cuticles and dry skin. My hands suffer all through the year and i find that hand creams just don't seem to do as they are supposed to.That was until i tried Ameliorate intensive hand treatment.My hands are the softest and smoothest that they have ever been after using this product and this is definitely a product that i will be keeping in stock without a doubt.I love it!!! I have very dry hands and have tried what feels like every hand cream on earth. This has been the best for me. It absores brilliantly and the appearance of my skin is much improved. I have also used it on my 8 year old daughters hands as she also suffers from dry skin. It's works a treat for her too. Best Hand Product I've ever used! I love this product and will be a life long user, my hands and particularly my cuticles look so much better than ever before. After years of dry looking wrinkled hands and poor looking cuticles caused by the cold weather and constant washing up I am amazed to find a hand cream that reverses all the damage in a short space of time. No hiding my hands in gloves this winter.